Fragrance free hypoallergenic, 100% biodegradable and totally chlorine free, these organic baby wipes are not only kind on your babies skin but are good for the environment too! Ideal for Sensitive Skin these fragrance free wipes are made with organic Aloe Vera which heals, moisturises and nourishes delicate skin. Not just for bottoms, these soft and gentle wipes are handy for faces and sticky fingers too! Lotion contains over 95% organic ingredients, certified by the Organic Food Federation. Free from chlorine, alcohol, paraben preservatives and sodium laureth sulphate. 72 wipes in a handy re-sealable pack. Aqua (Water), Aloe Barbadensis Leaf Juice* (Organic Aloe Vera), Citrus Aurantium Amara (Orange Blossom) Flower Distillate (Floral Water), Levulinic Acid, Sodium Levulinate, Glycerin, Potassium Sorbate (Approved Preservative), Citrus Grandis Seed Extract* (Organic Grapefruit Seed), Citric Acid (Fruit Derived)*Certified Organic. Hypoallergenic: Consultant dermatologist approved and PH balanced. 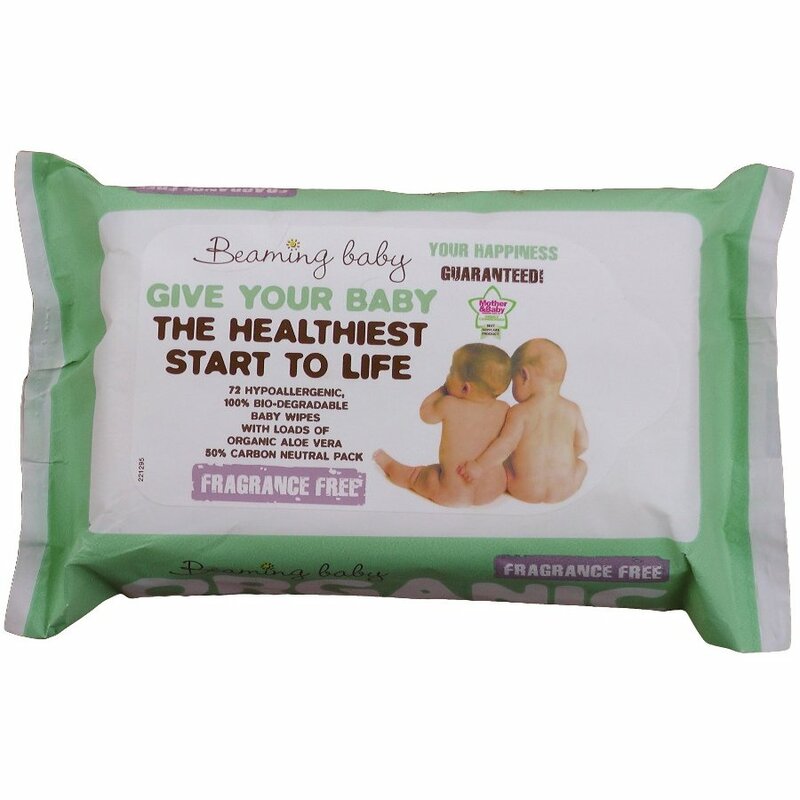 There are currently no questions to display about Beaming Baby Organic Baby Wipes - Fragrance Free 72 Sheets.